Hotel Explora en Patagonia, Torres del Paine, Patagonia. You've certainly lived up to your stellar reputation once again! You spoiled us on the last trip you arranged for us and you've certainly lived up to your stellar reputation once again! We had a fabulous time. After floundering around for weeks trying to figure out what to do in Chile, where our son was studying, I finally decided to call you. Why I didn't do that earlier, I don't know, but I didn't realize that Chile was another area you have plenty of expertise in. Before jumping into the trip details, I want to take this opportunity to thank you yet again, profusely, for all the assistance you gave me in planning this trip. We sincerely appreciate the fact that you offer so much flexibility for our tight schedule and can tailor trips to our interests with very little price difference This is something big tour companies just can't do! Your patient, cheerful, prompt consideration of all our time constraints, interests and concerns never ceased to amaze me. Thank goodness I called you! Chile's such a varied country, I just didn't know what to do. You were able to put together another unforgettable trip for us! Because we missed our flight out of JFK to Santiago thanks to delays upon delays, we ended up flying standby. Your folks were right there to get us and adapted our schedule that afternoon. We loved the restaurant we had lunch at! A word about our guide -- Grace Gonzales. She was incredibly helpful when we were trying to connect with our son that day. She and he spoke several times before we got there and when things got confusing finding the restaurant, she actually left and got our son when he was walking to meet us from the metro. She was wonderful! The tour that afternoon was good, but we were exhausted, so I'm not sure we really appreciated it! The Rugendas was a very nice hotel and they even packed us breakfast for the early EARLY flight we had up to Calama the next morning. Hotel Explora en Atacama, San Pedro de Atacama, Atacama Desert. The Explora. What can we say? It was exquisite! We stayed 3 nights/4 days in San Pedro de Atacama and 5 days/4 nights in Torres del Paine. The two were more different than we expected, although the model is basically the same. Fabulous surroundings, great food, great rooms, great facilities, excellent excursions, excellent guides and wonderful guests with whom to socialize! Key to the Explora is its excursions. All the guides gather in the bar the night before and the guests break into small groups to discuss what they want to do the next day. The excursions can be rigorous or not, 1/2 or full day and include hiking, mountain biking or horseback riding. At Atacama, the guides make certain you've acclimated well to the altitude before recommending a particular trip (and sometimes they know you are not ready for something even if you think you are!) The groups don't exceed 8 people per guide (sometimes less depending on how many sign up) and over a period of days, one tends to run into the same folks on trips. For us, this added to the fun because the people were GREAT. (It was a very international crowd -- Brazilians, Swiss, Germans, Brits, Italians and very few Americans.) We hiked mostly, and scenery and wildlife exceeded our expectations by far. 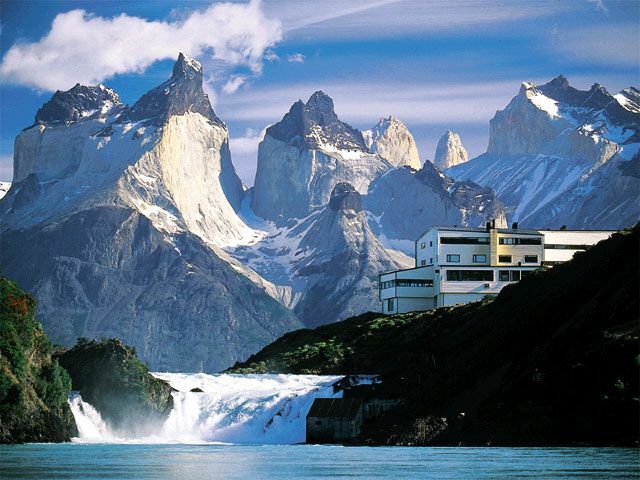 (We figured Atacama would pale in comparison to Torres del Paine. Not so!) The guides were extremely interesting, considerate and knowledgable. The atmosphere in Atacama was very gracious and we felt like we were on an old hacienda. Valley of the Moon, Atacama Desert. Photo: Servicio Nacional de Turismo, Chile. A high point was the Chilean BBQ nearby which was fantastic and so fun! Because guests tend to come and go in 4- or 8-day intervals, the BBQ can be like a goodbye party, which is was for us. The staff said some groups "click" and some don't... and that ours really did. We agreed. We didn't go hoping to meet people, but as it all worked out, we had a better time because of the folks we met! As for trips, we particularly enjoined the full-day road trip up to the Altiplano, the "cactus walk" and the sunset excursion to the big salt lake. The flamingos were unbelievable. The weather was definitely warm and the sun intense (this was late November), but the excursions were designed to avoid the heat of day. One thing that's really nice, considering the expense, is that because the airport is only 1 1/2 hours away, morning excursions leave early-ish and afternoon excursions leave mid- to late-afternoon, you can arrange to do an excursion the afternoon you get there and the morning before you leave. From Atacama, we flew down to Santiago and even though our flight was late, your folks were right there to take us out to Vina del Mar. It was almost midnight and it was a long trip, but the guide and driver were chipper and helpful. Thanks so much for arranging that for us! We had a great visit with our son, who was studying in Valparaiso. The Cafe Turri which your recommended was a wonderful spot. We'd read complaints about it being a tourist trap, but the food, the view and service were great. We sort of did our own thing in Valparaiso, so I'll keep this part short, except to say if folks have time, they should get out in the neighborhoods and explore. It's a very cool place... and Vina is beautiful. From Santiago, we flew down to Punta Arenas, met the Explora folks (along with the other guests) and started the 5-6 hour trek up Torres del Paine. (There's a good reason why the Explora restricts exit and entry dates -- the trip back and forth to Punta Arenas is SO LONG, they just can't commit the time and resources to drive back and forth every day.) Along the way, we had a nice lunch/pit stop and we got to take pictures of the Paine Massif and the towers on the way into the park. 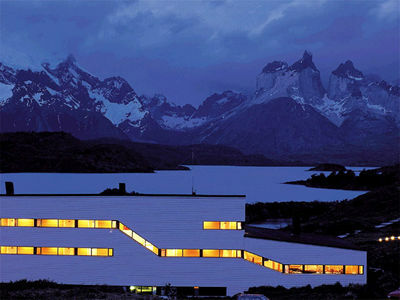 The Explora has an exquisite setting on Lago Pehoe and the facility takes advantage of its unbelievable view of the Cuernos from every possible angle. We were in a suite and it was FABULOUS. Unlike Atacama, where everything was open-air and like a hacienda, the Explora here was much more modern and enclosed (for obvious reasons), but equally beautiful. We felt the food was somewhat better here, although it was really good in Atacama, and the two-level dining room a bit more crowded. There is a GREAT cocktail party every night before dinner when you meet with the guides. The appetizers were incredible! There were a lot more Americans than in Atacama. Unlike Atacama, there were fascinating lectures and movies offered in the evening for those wanting to beef up on the local geology, flora and fauna. 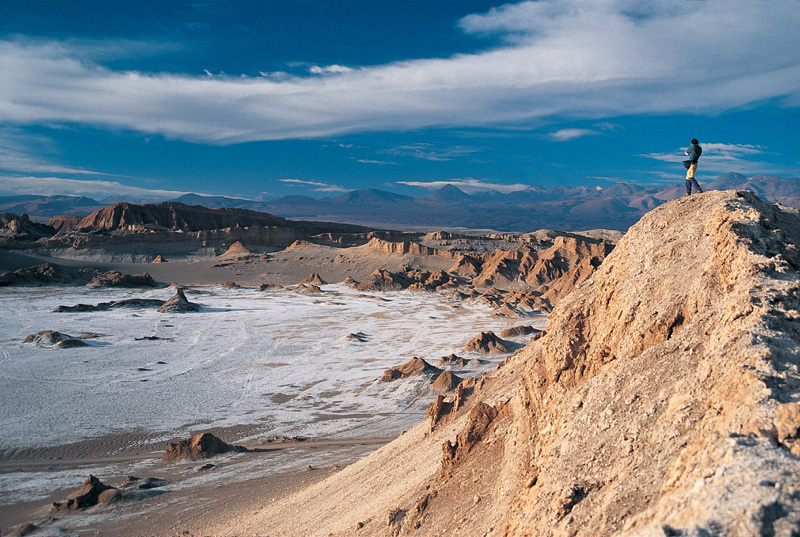 (We think Atacama could do a bit more on the geology scene for those interested.) The separate spa facility w/ pool was down on the lake and so peaceful. There are three Jacuzzis in which to relax out on the deck and you can have the beverage of your choice as you enjoy life! 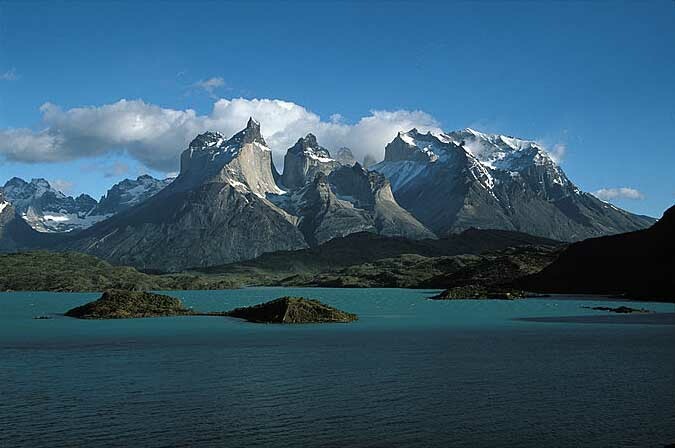 Cuernos Mountains and Lake Pehoe, Torres del Paine, Patagonia. The hikes and guides were fantastic. All Explora guides go through 2 months (!) of rigorous training before they start out with guests and many had been with Explora for several seasons. We loved our hike to Grey Glacier and the French Valley, both day hikes, as well as our hike to the drier eastern part of the park where we saw ample guanacos and condors. Like Atacama, there was a BBQ at the local estancia where the horses are kept, a van ride from the hotel, which was great fun (but it's in the afternoon not evening so there's not quite the party atmosphere). Afterward, altho' we aren't experienced, we went on a terrific easy ride under the watchful eyes of "real live" gauchos. A word about the weather -- it's not dependable but it's not that cold and only really windy in places. Before we were there, they had 3 unusual days of fantastic weather. Our weather was "okay" and the day we went to French Valley, it got quite bad. But -- dress right (including waterproof gear -- water resistent just doesn't cut it when it's pouring) and go with the flow. The guides know what they're doing and dealing with the elements is part of and adds to the experience. Whatever you do is incredible! The guides even lug picnic lunches with them, which they lay out on checked tablecloths at the base of the glaciers or wherever you happen to be! The hot soup and coffee with optional Bailey's sure taste good out on the trail! Well, I've gone on and on. I guess I can't rave about the Explora enough. Thanks for encouraging us to go to Atacama, as well as Torres del Paine, and for arranging for us to go to the Explora even though we were a little late with request. Thank you especially for your patience in working with me to hammer out all the details! You are the best!